The native form of this personal name is Vajna András. This article uses Western name order when mentioning individuals. 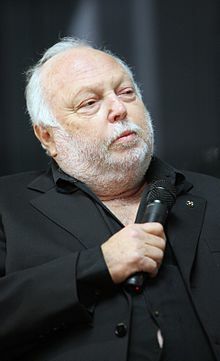 Andrew G. Vajna (born András György Vajna; 1 August 1944 – 20 January 2019) was a Hungarian-American film producer. Andrew G. Vajna was born in Budapest to György Vajna, a merchant of Jewish descent (born Weidmann), and his wife, Klára. In 1956 at the age of 12, he fled from Hungary and with the support of Red Cross he made his way alone to Canada. He arrived having no friends and speaking no English. Later on he reunited with his parents in Los Angeles, USA who fled Hungary separately. He studied cinematography at University of California, Los Angeles and then joined the University's Educational Motion Picture Department where he worked on different projects. Preferring being independent Vajna left UCLA to set up his own photo studio, but that venture soon came to end when he broke his leg in a ski accident and business could not operate for 9 months. After his recovery he became a hairdresser and teamed up with a boyhood friend, Gábor Koltai, a wig stylist in Hollywood, to produce high quality wigs. Vajna moved to Hong Kong where he established his own wig manufacturing company, called Gilda Fashion. Finally Vajna sold the firm in 1973. By that time the company employed more than 3,000 people. Vajna launched his career in the entertainment industry with his purchase of motion picture theatres in the Far East. He founded Panasia Films Limited in Hong Kong, a highly profitable venture in the distribution, acquisition and representation of films. After Vajna negotiated the sales of Panasia to Raymond Chow's Golden Harvest Company in 1976, and met Mario Kassar at the 1975 Cannes Film Festival, he and the film producer and industry executive formed Carolco, specializing in sales, financing and distribution of films worldwide. Vajna and Kassar had rented a small office in Melrose Avenue where their desks faced each other in the office and Vajna's wife and Kassar's girlfriend were their secretaries. In less than four years, Carolco became one of the top three foreign sales organizations in motion pictures industry. In 1982, Vajna was a founder and then president of the American Film Marketing Association. During that same year, Vajna and Kassar made their film production debut with Rambo: First Blood, starring Sylvester Stallone. First Blood was a success, grossing $120 million internationally. Rambo: First Blood Part II was released in 1985, generating more than $300 million worldwide. Vajna was executive producer with Mario Kassar on such films such as Alan Parker's Angel Heart, and Rambo III. Other projects include Music Box, Mountains of the Moon, Total Recall, Air America, Narrow Margin and Jacob's Ladder. In December 1989, Vajna sold all his interest in Carolco for $106 million and formed Cinergi Productions, Inc. to engage in the financing, development, production and distribution of major event motion pictures. As part of its business plan, Cinergi has formed an alliance with The Walt Disney Company for distribution of Cinergi motion pictures in the United States, Canada and Latin America. Vajna's strategy was to develop long-term relationships with certain talent and produce a steady supply of two to four event motion pictures per year. John McTiernan directed Cinergi's first production, Medicine Man. Christmas 1993 saw the release of Tombstone, the Wyatt Earp/Doc Holliday legend. In 1994, Cinergi released Renaissance Man and Color of Night. The summer of 1995 saw the release of two Cinergi productions. The first was Die Hard with a Vengeance. To date, the film has grossed over $365 million worldwide. The second release was Judge Dredd. Also in 1995, Cinergi released two more films: The Scarlet Letter and Nixon. Nixon received four Academy Award nominations. Another Cinergi release was Evita starring Madonna. The film was a commercial success, grossing $141 million worldwide. It has also won the Golden Globe for Best Picture of 1996 as well as the best actress and best original song awards. Vajna never forgot his Hungarian roots and always tried to help the Hungarian film industry. He had a major role in many films being shot in Budapest, such as Evita, Escape to Victory and Red Heat. He also participated in the distribution of Motion Pictures in Hungary eventually having a 70% share of the Hungarian box office. In 1989 Vajna founded InterCom that has become a market-leader and a distributor of many Hollywood studios, including 20th Century Fox, Warner Bros., Sony Pictures, Disney and MGM. He was a producer of the record-breaking Hungarian comedy Out of Order aired in 1997. With 750,000 viewers in cinemas and several million on television it broke Hungarian box office records. In 1998, Vajna took Cinergi private by buying out the public stockholders. Thereafter, he joined together with his former partner, Mario Kassar. Their first return venture into big budget Hollywood I Spy starring Eddie Murphy and Owen Wilson was shot in Budapest. In 2002 he founded DIGIC Pictures in Hungary which is an animation studio specializing in full 3D animation and visual effects. In 2003, he and Kassar produced Terminator 3: Rise of the Machines with Arnold Schwarzenegger. In 2005 Vajna was, together with Quentin Tarantino and Lucy Liu, the executive producer of a feature-length documentary called Freedom's Fury, created by Colin Keith Gray and Megan Raney Aarons, which showed his renewed interest in the story of the 1956 Hungarian Revolution. The film called The Children of Glory, which showed the Hungarian Revolution of 1956, was Hungary's most successful movie in 2006 having been viewed by more than half a million people. From 2011 Vajna worked as the Government Commissioner in charge of the Hungarian film industry. In the same year Vajna conceived Hungarian National Film Fund with the mission to contribute to the production of Hungarian films or co-productions that provide art and entertainment for moviegoers and bring significant success both domestically and on an international level. Under Vajna's supervision, the money spent on film production in Hungary had doubled between 2011 and 2014. The Film Fund provides transparent financial and professional support as well as creative cooperation, marketing support, professional expertise and international industry contacts, handling festivals, sales activity and apprentice program. One of the recent films that received financial support from Hungarian National Film Fund was the hard-hitting drama Son of Saul, which premiered at the 2015 Cannes Film Festival where it won the Grand Prix. It also won the Golden Globe for Best Foreign Language Film, becoming the first Hungarian film to win the award. As its biggest achievement, Son of Saul was the 2016 Academy Award winner in the foreign language category. During the Vajna era Hungarian movies financed by the Hungarian National Film Fund won altogether more than 130 international awards while the number of foreign films produced in Hungary increased significantly. Following his return to his native country, Vajna played an important role in reinforcing Viktor Orbán's government control on the media. In 2015 he bought the Hungarian TV2 Group, the country's second-biggest commercial channel. The state-owned lender Eximbank, which usually supports export companies, helped Vajna's acquisition. In 2015, TV2 won nearly a fifth of state advertising spending, four times more than its nearest rival, according to the independent Hungarian watchdog Mérték Media Monitor. Under Vajna's ownership, the channel's editorial stance was strongly in favour of the government. From 2016 until his death he also owned the Rádió 1 radio station. In 2017 he bought Lapcom Zrt. which includes the tabloid Bors, and the regional dailies Délmagyarország and Kisalföld. Vajna died at his home in Budapest following a long illness on January 20, 2019. He was 74. ^ Daniels, Bill (November 29, 1989). "Vajna to receive $106-mil from sale of his Carolco Pictures stake". Variety. p. 3. ^ "Hungarian National Film Fund". European Film Promotion. Retrieved 22 January 2019. ^ "Andy Vajna's website". andyvajna.com. Retrieved 2017-02-28. ^ a b Byrne, Andrew (2016-08-16). "Orban tightens grip on Hungary's media". Financial Times. Retrieved 2018-11-28. ^ Dávid, Sajó. "A cégbíróság szerint is Vajnáé a TV2" (in Hungarian). Retrieved 2017-11-16. ^ Bienvenu, Helene (2016-10-11). "Newspaper Closes in Hungary, and Hungarians See Government's Hand". The New York Times. Retrieved 2018-11-28. ^ Dávid, Sajó. "Class FM helyett Andy Vajna rádióját kapja a fél ország" (in Hungarian). Retrieved 2017-12-01. ^ Gábor, Földi. "Hivatalosan is Andy Vajnáé a Bors" (in Hungarian). Retrieved 2017-11-16. ^ "Andy Vajna, Producer of 'Rambo' Films, Dies at 74". Retrieved 2019-01-22.